While this one reminded me of ... hmmmm. Monday, July 23, 2018: Some updating info. Unfinished: The West Thorofare trestle cross-under -- to connect Ship Bottom with the Forsythe refuge’s Cedar Bonnet Island Nature Trail via sidewalk – is still very much under construction. When done (soon, I’m told), the walkway beneath the bridge will allow pedestrian and bike traffic to access the new Forsythe facility from LBI. Currently, the only way to get to the trail is by vehicle -- pulling onto the overlook parking lot, off eastbound Causeway. Here’s a photo look-about going from the walkway under the East Thorofare trestle bridge (Hochstrasser's; Ship Bottom). Note: You can still pass under the East Thorofare trestle bridge in Ship Bottom, just north of the boat launch. Since I'm on a bit of a Causeway roll. I saw, firsthand, why neither the East Thorofare (Hochstrasser) and West Thorofare (Dutchman's) trestle bridges are pretty much unfishable, even though the NJDOT said they would be angler-friendly. The aluminum barriers facing the water are simply too high to comfortably fish over -- or under. What's more, the water is way too far down when fishing over the railing. I see by a couple plugs hung up in nearby high-tension wires that folks have given the once-popular fishing spans a go. I positioned myself in every way possible and short of bringing in five-gallon buckets to stand on -- DO NOT try that! -- there's no way, Jose. Once the building is done, there will still be "troll" areas to fish beneath the bridges. A few guys were under there today. But, up-top (and over) fishing has gone the way of too many LBI traditions. And railings way too high. Bummer. Galloway, N.J. – Former U.S. Congressman and Brigantine resident, Patrick J. Kennedy, and Kevin A. Sabet, founder and president of Smart Approaches to Marijuana, (SAM) will discuss the potential impact of the legalization of marijuana from 1-3 p.m. Thursday, August 2 in the Campus Center Theater. The topic of the talk is “Marijuana Legalization in N.J.: Are We Sure?” Both Kennedy and Sabet question current state efforts to legalize marijuana. Kennedy is the author of “A Common Struggle,” in which he discusses his own battles with mental health and addiction and links them to national mental health care policy. The former Democratic representative from Rhode Island and mental health advocate serves on President Donald Trump’s opioid epidemic commission. SAM’s mission is to educate citizens on the science of marijuana and to promote health-first, smart policies and attitudes that decrease marijuana use and its consequences. Its goal is to seek a middle road between incarceration and legalization.lic health and safety. Among the topics to be discussed are: Lessons learned in legalized states, the mental health effects of marijuana use, marijuana potency and price trends in the legal and illegal markets, emergency room and hospital admissions related to marijuana, the cost of implementing legalization from law enforcement to regulators, the cost to employers and impact on productivity, usage among youth and school incidents related to marijuana, drugged driving, and societal costs. This event is free and open to the public. There will be a question and answer period. The FAO released their annual State of the World’s Fisheries and Aquaculture Report this month. The FAO said that total fish production in 2016 reached an all-time high of 171 million tons, of which 88% was for direct human consumption. This also represented a global high in per capita consumption, of 20.3 Kg. (live weight). “Since 1961 the annual global growth in fish consumption has been twice as high as population growth, demonstrating that the fisheries sector is crucial in meeting FAO’s goal of a world without hunger and malnutrition,” said the FAO. Aquaculture represented 53% of all directly consumed seafood. In 2016 Alaska pollock was the top species, temporarily displacing Peruvian Anchovies, but in 2017 a recovery in anchovies should put them back on top. All the most valuable species groups with significant production – lobster, crabs, shrimp, and mollusks, marked new catch records in 2016. The FAO has revised its terminology around the sustainability status of various fisheries. Their new term, Maximally Sustainably Fished Stocks, represented 59.9% of commercial harvests. 33.1% of the stocks were classified as being fished at biologically unstainable levels. The problem regions, according to the FAO, were the Mediterranean, the Southeast Pacific, and the Southwest Atlantic. These areas had 58 to 62% of their stocks overfished. By contrast, the Northeast Pacific, Northwest Pacific, and Central and Southwest Pacific had the lowest levels of overfishing, with between 13% and 17% of stocks overfished. Since 1961, global food fish consumption has grown at an average rate of 3.2%, while population growth has averaged 1.6%. The expansion in consumption has been driven not only by increased production but also by a combination of many other factors, including reduced wastage, better utilization, improved distribution channels and growing demand, linked with population growth, rising incomes and urbanization, says the FAO. The federal NDP critic for Fisheries and Oceans is proposing legislation that would overhaul fish farming by moving open-net fish farms from the ocean to land in an effort to stabilize and grow dwindling wild sockeye salmon numbers. "The impact to wild salmon has been a huge concern," MP Fin Donnelly said to All Points West host Jason D'Souza. "I want to see healthy watersheds, healthy fish populations." Reports have shown that wild sockeye salmon that come into contact with fish farms are more likely to be introduced to a number of problems, including parasitic sea lice — which attach themselves to the fish, weakening and sometimes killing them — and the piscine reovirus (PRV). PRV affects salmon's ability to swim upstream, which makes it harder for them to return to their spawning grounds. 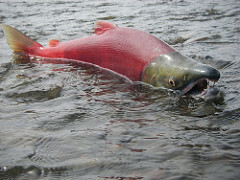 "There's got to be a better way to raise these fish and to protect our wild salmon," Donnelly said. "The most plausible solution I've heard is to adopt a new technology called RAS [recirculating aquatic systems], which has been developed out of the United States and implemented here in Canada." The idea is to build large tanks that are filled with circulating water to recreate the ocean's environment. Donnelly recognizes that open-net fish farmers have made improvements over the past 15 years, but that "essentially, they are still using the ocean as a toilet" to dilute some of the problems involved with sea farming, like pesticides and sea lice. "With farming in general, it's always disease management. When you put farms in water, it gets even harder to control diseases," Donnelly said. He believes that on-land facilities offer farmers the opportunity to better control their environment and mitigate the risks to wild sea life, specifically sockeye salmon. "You'd put thousands of people out of work"
Open-net fish farms are a large industry on Vancouver Island and Shawn Hall, spokesperson for the B.C. Salmon Farmers Association, says that mandating on-land closed-containment farms would, effectively, be legislating the industry out of business. "You'd put thousands of people out of work. These are real people … supporting their families," said Hall. Hall says that moving the farms onto land also comes with environmental consequences, such as clearing and paving land for the tanks, as well as the use of electricity to circulate water. Donnelly is aware that closed-containment farms come with some concerns. "With all industry, we're going to have an environmental impact … That's a legitimate concern and one that's going to be looked at," said Donnelly. Hall admits that on-land fish farms are potentially the future of the industry, but doesn't believe the industry is ready for large scale operations. "Make no mistake about it, there's a lot of work going on for the potential for on-land aquaculture being part of the solution. And our members are actually world-leading experts … but mandating that as a wholesale move right now would shut the industry down," said Hall. Hall agrees that open-net fish farms have had challenges with parasites and diseases, including toxic algae outbreaks, but says his industry has evolved over the past 30 years and believes open-net fish farms can operate in an environmentally friendly and responsible way. "There just aren't enough wild fish out there to feed a hungry human race. If we are going to eat fish, we need to farm it. And we farm it responsibly here," Hall said. Landlocked Salmon Farms Cropping Up In U.S.
Salmon is now being grown in the nation’s first landlocked fish farm in rural Wisconsin. Earlier this month a company called Superior Fresh sent its first batch of 2,000 pounds of fresh 10 pounders to Festival Food stores across the state. Plans call for an annual output of about 72 tons of Atlantic salmon and steelhead trout from the so called fish house which adjoins a large greenhouse - making it the largest aquaponics facility in the world. In the growing system, which uses no pesticides or antibiotics, water that is drawn from two deep wells feeds into a hydroponic set up that produces 20,000 heads of lettuce every day. That water then recirculates back to the fish tanks; the less than one percent of waste water is used to irrigate alfalfa for hay production. Wisconsinites hail the dual output as the future of environmental-controlled agriculture. Superior Fresh says it is “priming the pump” for fresh greens and fish to be sold year round in places where it wouldn’t otherwise be possible. The east coast has even bigger plans for the world’s largest land-based salmon growing business, minus the greenhouse. Nordic Aquafarms of Norway hopes to soon break ground on 40 acres in Belfast, Maine and eventually produce nearly 70 million pounds of Atlantic salmon each year. The salmon will be grown in tanks holding up to 2 million gallons of recycling water, sourced from a reservoir no longer used for the city’s water supply. Nordic Aquafarm president Erik Heim said that the U.S. currently imports more than 80 percent of its seafood. Raising the salmon in Maine cuts shipping time and costs and delivers a fresher product to American customers. Battles over endangered species have consumed vast swaths of the West for decades, and confrontations over protections for the spotted owl, the sage grouse and the gray wolf have shaped politics and public debate. While the changes proposed Thursday by the Fish and Wildlife Service and the National Marine Fisheries Service wouldn't be retroactive, they could set the stage for new clashes over offshore drilling and also could help smooth the path for projects like oil and gas drilling in the Arctic National Wildlife Refuge. Environmental activists criticized the proposed changes, saying they would put species at risk of extinction. ''These proposals would slam a wrecking ball into the most crucial protections for our most endangered wildlife,'' said Brett Hartl, government affairs director at the Center for Biological Diversity. The Supreme Court has agreed to consider whether the federal government's designation of private land in Louisiana as ''critical habitat'' for the frog limited the owners' ability to develop it. Mr. Gordon said if the proposed rules had been in place, the property would have been less likely to be designated as such. Environmentalists expressed concern the changes will gut protections for the country's most threatened species and weaken the agency's ability to address climate change. The changes, they contended, are part of a broader effort by the Trump administration to dismantle ecosystem protections and disregard science when making decisions about the environment. The Interior Department and the Department of Commerce will give the public 60 days to comment on the changes before finalizing them. Typically, proposals don't change significantly as a result of the public comment period. Thursday's proposals also include a change that, while technical, could give the government greater leeway to play down climate change in judging whether a plant or animal is at risk of extinction. Environmentalists criticized the change -- which involves writing a new definition for the term ''foreseeable future'' -- as giving the government greater leeway to discount future effects of global warming. Bob Dreher, senior vice president for conservation programs at Defenders of Wildlife, an environmental group, said that could put climate change in the cross hairs. ''If they define it narrowly, then they'll close their eyes to the fact that 30 years down the road polar bears will be endangered due to sea-level rise,'' he said. Mr. Bernhardt on Wednesday also said that a section of the law that provides for consultations among federal agencies when considering permit applications would be streamlined. He described it as ''where the rubber meets the road of the Endangered Species Act,'' and said he expected the process to be improved. ''Our general intention is to maintain the scope of consultation, but that's always in the eye of the beholder,'' he said.